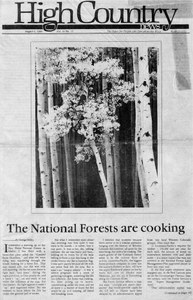 Louisiana-Pacific will soon have two aspen flakeboard plants on line in western Colorado, raising questions about "multiple use" forest management. At sites throughout the West, Department	of Energy contractors are scurrying to remove uranium tailings from buildings and lots where they have been sitting for 20 years or more. Fruit growers, cattle ranchers and energy and tourist industries have sued about transmountain diversion for a half century. Montana's rugged Rocky Mountain Front sees first attempts at major drilling.